The Glove Connection, designed by Bellingham's Joe Holdridge. The ‘game’ Bailey has been ‘playing’ for the last six years is golf training aids - a highly competitive arena from which only a select few emerge unscathed. To give you an indication of just how many training aids are available today, one Florida-based online store offers a staggering 380 different items designed to improve some aspect of a golfer’s game. Almost 200 companies that manufacture training products will be exhibiting at the 2014 PGA Merchandise Show in Orlando. A handful of hopefuls can hope to earn the status and riches they dreamt of when devising their concepts, but for most it is a desperately frustrating existence, tinkering in vain while ploughing life savings into gadgets and contraptions they are convinced will revolutionize golf but which are either unsellable or just plain don’t work. Bailey and the Glove Connection occupy an area somewhere in the middle of the two extremes. The product definitely works but, six years after its launch and after putting in hundreds of hours, Bailey has yet to unlock the formula for success. 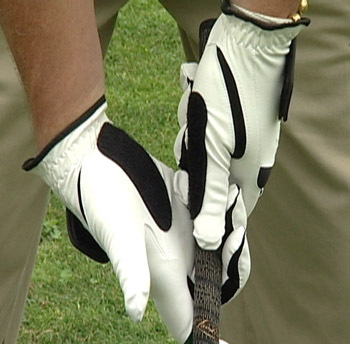 The Glove Connection was invented by Joe Holdridge, co-owner of an indoor golf lab in Bellingham, Wash., where customers can play on simulators, get custom-fit for new clubs, have their current clubs repaired, or take a lesson – Holdridge is a PGA instructor and a former head professional at Old Del Monte in Monterey, Calif.
During his many years as a teacher, Holdridge discovered countless students were guilty of the same swing flaw which more or less prevented any chance of their making solid impact. Their hands were disconnecting, or separating, at the top of the backswing. “That forced them to re-grip the golf club on the way down changing the face angle of the club at impact,” says Holdridge. 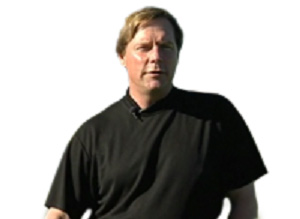 Joe Holdridge (click on photo for Joe's Professional Golf Lab page). Though not gripped with excitement to quite the same degree as Bailey, Holdridge certainly wasn’t averse to the idea and gave his friend the go-ahead to draw up a business plan. Bailey got to work, convinced the Glove Connection would be a sure-fire hit. They needed money too, of course. Fortunately, Holdridge had a friend who immediately saw the merit of the Velcro-ed glove, and who wasn’t short of a bob or two. Al Koch had retired in 1998 from Santa Barbara Research Center (now Raytheon Company) where he had worked as a staff engineer specializing in electro-optical instruments for earth-observing satellites. He was the sole proprietor of a company that provided Computer Aided Design services to various auto, medical/dental, and defense companies. He was the Chief Financial Officer and owned 50% of K2 Enterprises Inc. a construction company specializing in single family residential homes. And last but not least, he was the major owner of Joe’s Professional Golf Lab LLC., which Holdridge had operated successfully since it opened in August 2006. 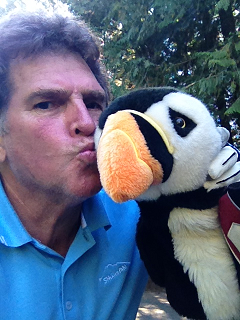 A fair chunk of the cash went to a Chinese factory that produced 5,000 pairs of the Glove Connection which Bailey exhibited at the Seattle Golf Show in 2008. Unlike, the PGA Merchandise Show in Orlando, Fla., the Seattle show welcomes consumers who are able to test the new equipment on display. The Glove Connection booth saw a fair amount of traffic. “We were pretty busy,” says Bailey “We saw about a hundred people over the three days and probably sold gloves to three-quarters of them. We got some very positive feedback, and deemed the whole weekend a success.” A web site (thegloveconnection.com) was soon established from which the gloves could be purchased for $29.95, a price Bailey thought was reasonable given their costs and anticipated sales. He assumed they would fly out the door. Bailey also took The Glove Connection international negotiating a distribution deal with a Japanese entrepreneur based in Tokyo (but who also had an office in Cupertino, Calif.) and introduced to him by a friend from Malaysia. Japanese golfers were true fanatics that took the game incredibly seriously. Surely they would jump at this chance to improve their ball-striking so affordably. Still, something obviously wasn’t clicking. Bailey had had some bad luck with the timing of the Japanese tsunami, but he knew this beautifully simple product could have a profound effect on an average golfer’s game. He had seen it happen dozens of times. And he’d received nothing but positive responses from everyone that had tried it. He had obviously miscalculated somewhere. Bailey also thinks he took too much on himself. Joe Holdridge invented the product, Al Koch made the initial investment, Bailey’s wife Mary, an artist, created the logo, and Hand Crank Films produced the TV commercial. Besides that though, Bailey did everything - marketing, distribution, ad-buying, accounting, not to mention spending hours on the phone with Japan. For someone without a business qualification or, indeed, any business experience whatsoever, it was asking a lot to establish the Glove Connection in so implacable a sector. But don’t think for a second Bailey has given up.